I wish I was a trend setter, but in most cases I wind up chasing the latest buzz months after the news hit the street (in other words, the local wine press). In this case, there have been write ups about the latest wine bar/store/importer in Tel Aviv, specializing in Portugese wines. The store is called Porto and it is the love child of chef/importer Eyal Maron. The wines fall into three or four price brackets. Entry level wines are about 60-80 NIS, Reservas are 100-120 NIS and the premium wines are in the mid 200's. There were also a couple priced at 400 plus, but that's the price cap on these wines. A few thousands less than the price cap in the wine regions I regularly indulge in (the big B's). I tasted a Tawny Port with Eyal, which was quite nice. It's been a long time since I drank a Port, let alone enjoyed one. I didn't write down the name - next time. But I really came for the dry wines and Eyal poured a couple of wines for me and helped me pick out a few more purchases. Herdade do Mouchão is a producer from the Alentejo region, which is a southern region whose trademark grape is Alicante Bouchet. The region is further divided into sub-regional DOCs, but the top estates, like Mouchão, prefer to use the Vinho Regional Alentejo for their flagship wines, which sort of parallels the French Vin de Pays, allowing them greater flexibility. The Dom Rafael, 2009 is their value wine and is made up of allowed varieties (besides Alicante Bouchet there is also Aragonex and Trincadeira) so it uses the Alentejo DOC. And it costs 120 NIS. Now, when I first encounter what is for me a new grape from a new region, I don't readily pick out specific flavors and aromas. I rather get distracted by the sheer 'newness'. Then I seek out some reference points. I told Eyal at the bar (and drinking the wine later at home only reinforced my impression) that it reminds me of lower tier Southern Rhone cuvees - you know, not the ones Robert Parker lavishes points on, but the stuff you can actually drink. So, this is a palatable wine for me, and interesting, even if, I have to admit, it's not my first choice as far as style is concerned. It's spicy and dusty, which is why it reminds of, say, Gigondas, but the fruit has a different profile, a little nutty and very mellow. A fine night for a winter evening and very likeable. 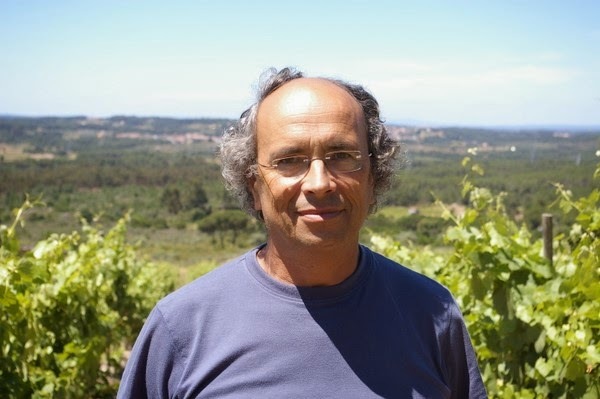 The other producer I tasted and purchased is Alvaro Castro from the Dao region, who bottles his wines under a couple of quinta (family estate) labels. The Dao, Quinta de Pellada, Branco, 2012 is an entry level white I bought for about 80 NIS without tasting as an introduction to Portugese whites and it exceeded my expectations. It has a very pleasant green-tinged aromatic profile, with more complexity than I'd expected and a tasty saline finish. Think why well-made Aligotes are gaining so much cred these days to understand my affection for this discovery. The blend is another headache for my spellchecker: 40% Cerceal, 40% Bical, 20% Encruzado. The Branco, Reserva, 2012 costs 120 NIS and has riper fruit and a greater presence for the additional cost of ownership, with a tint of smoked salt. To be quite honest, though, I prefer the regular. There are reds, too, of course, and I took an immediate liking to the Dao, Quinta de Pellada, Reserva, 2011. This wine thrives on vivid freshness, smelling and tasting as though the fruit was picked at the second it reached phenolic ripeness, retaining every milligram of acidity - the fruity perfume being so on point, without any excess, while displaying an almost feral earthiness; while the palate is more of the same, very lively and tasty. The grapes are a field blend of Touriga-Nacional, Alfrocheiro, TintaRoriz, Jaen - and thank God we're not going to be quizzed on this stuff. Simply a lot of wine for 120 NIS. Finally, at 229 NIS, the Dao, Quinta de Pellada, Pape, 2010 is, unsurprisingly, the highlight of my foray. Also a field blend (Baga and Touriga Nacional), it offers greater complexity and breed than the Reserva, while the lively acidity makes it just as juicy, fresh and tasty. There earthy aromatics I found in the Reserva are more refined, are actually more about rock than dirt, and counterpointed by herbs and a hint of leather - while the finish is longer and more saline, with appropriately bitter tannins. This could improve over five years, maybe more. Again, I get a sense that the vineyard work was as meticulous, the harvest just as well timed. So, on the basis of this test drive, will Portugal replace Burgundy? Or Bordeaux? No way, but I'd give it 5:1 odds to replace anything Rhone south of Hermitage in my cellar. And, dear readers, if you're in any way attuned to my tastes, head on to Tchernihovsky 6 and have a tête-à-tête with Eyal.